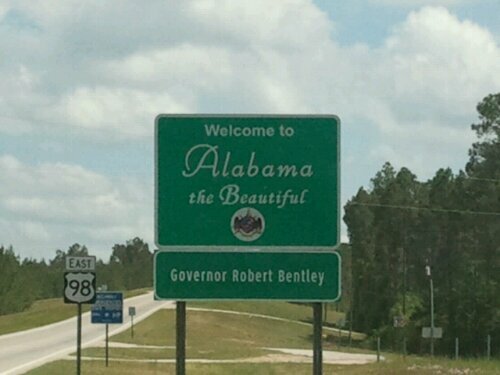 On April 9th my mom and I set out on a much awaited and much needed “girls only” road trip to Alabama. The beauty of a “girls only” road trip is that no men are allowed. Nothing against men of course, it’s just that when men are around they tend to think they are in charge and want to call the shots. Not this trip! I drove as fast or as slow as I wanted. We stopped and peed as often as needed (about every hour). We kept the temperature at a perfect 81 degrees (no air-conditioning needed!) we stopped at every hole-in-the-wall shop that we saw. The music was loud and the laughter was even louder! It was the perfect road trip….almost. After a long day of driving, we decided to pull over and stop for the night and finish the last leg of our trip the next morning. After we made our way through Jackson, Mississippi we decided to stop in Richland, Ms. for the night. Over the years, the kids and I had stopped in Richland to spend the night in a hotel many times with no problems. I assumed it would still be a good place to stop….I assumed wrong! As we drove up to the hotel I noticed that the name had changed from the Days Inn to a more generic name of, Executive Suites. (let’s just say, ain’t no executive gonna stay there) That worried me a little so we decided to do a slow drive by and see how things looked. As we looked in the lobby window we saw a dimly lit lobby with one lonely plastic plant that was leaning to one side and NO people…we took that as a sign a drove off in search of another hotel. Hint: if you want us to stay at your hotel….straighten your plastic plant!! The next hotel was even worse. The lobby was about the size of my car and you had to talk to the clerk through a hole in bullet proof glass! Hint: if the clerk is afraid for his life….. then so am I! Seriously? Did she have to say that? What’s the point? I did what any respectful daughter would do…I made her go in first. I had her to check for bodies and of course….cockroaches! If there was a cockroach in that room I would have slept in the car! After we had the all clear of bodies and cockroaches, the next thing to check was the sheets. Mom made a bee line for the bed and flung back the sheet and much to our horror there was five big, long, black, curly hairs!! gross! My mom began to infaticly declare, “nope, nope, nope…I can’t sleep here…I just can’t do it!” I immediately reached for the phone and requested another room with clean sheets. The lady at the from desk said, “oh, I am so sorry! I will put you in the room next door.”. We gathered our belongings and moved the new room. Once again we checked for bodies, cockroaches and then clean sheets. As before, mom flung back the sheets….once again…nasty sheets……crusty stuff! I’m not kidding! I began to see red, I was too tired for this kind of stuff. We called the lady back and asked if they ever washed the sheets. She assured us they did (I guess we just happened to find the only two dirty sets in the building). This time we watched her take sheets out of the dryer and put them on our bed. Finally we could rest a little easer. The next morning we were on our way once again. As we began to drive off I noticed that the bugs had done a job on my windshield the night before. I could hardly see to drive so we decided to find a car wash. Finding a carwash in Richland proved to be as difficult as finding a hotel. Finally we spied one. I paid the $7.00 and pulled into the bay. I put it in park, turned up the radio and we began chatting about our rough night. The water began to spray and the big roller started brushing the bugs away. Suddenly, out of nowhere mom began to yell, “oh my gosh!! I’m getting wet! !” I looked over and to my horror I see water coming through the sun roof! I could not believe my eyes! Wondering how it was getting in, I pulled the shade back that covers the sun roof and GOOSH!!!! Water came pouring in!! (one of the kids had left the sun roof partially open) My mother began to scream louder and we both panicked. I franticly told her to hop in the back seat to get out from under the sun roof. Have you ever seen a seventy year old woman HOP anywhere? Much less in to a back seat? She climbed up onto the console and then she just froze! She looked like a bird dog on point! Motionless! I said, “mom, you have to go! The sprayers are coming back over again! What are you waiting on?” She said, “I’m trying to find a place to step.” “it don’t matter!” I said, “just go!” Finally she piled in the back seat, soaked to the bone. I was still in the drivers seat getting wetter by the minute. Mom then said, “can’t you just drive out?” “yes I can”, I said……I punched the gas and bolted out of the car wash startling the woman who was changing the numbers on the gas price sign outside. As I came to a stop and jumped out, slinging water, I explained to the woman my dilemma and asked if she had any paper towels. She just stood there, expressionless, then casually pointed her finger and mumbled, “thay’s some over at the gas station.” Then she went back to work! Ahhhhh! I just wanted to scream! I don’t have time to go the the gas station! I need help now!! I was not happy to say the least. With mom still in the back seat looking like a wet dog, I went to the back of the car, grabbed my pajamas and began to mop up the best I could….all the while thinking….Devin is never gonna believe this! After I had I mopped up all I could with my pajamas, I drove over to the gas station and asked for some paper towels. The woman there never spoke a word. She just scuffed over to the counter and handed me a roll (did these people even have a momma to teach them manners?) When I got back out to the car mom was stripping out of her wet clothes….in the back seat…..in broad day light….this is getting crazier by the minute, I thought. I mean, you can’t make this stuff up! You REALLY CANNOT make this stuff up!!!! I have tears running down both my cheeks!!!!! Looking forward to additional updates. Glad you were in the vehicle when you discovered the sunroof opened. We know how much it costs to get 4 inches of rain removed from a Honda Pilot. Highly recommend Premier Body Shop and the wonderful job Ralph did of NOT laughing too loud when he looked at how much rain I let in! We have had a couple hotel stories in our trips from Tulsa to Florida over the years. I detest paying money and not having clean sheets and hot water…. Keep the laughs comin’. Love ya and the sharing.